The Dr. Slick Spring Creek Clamps have a very fine tip to more easily reach and hold smaller flies. They are particularly helpful for unhooking smaller fish. They will hold hooks securely enough that you can use them as a travel vise! The photo shows shiny and flat black. I only carry the flat black. These nippers are made from better steel than the cheaper ones, and the angled blades make it a bit easier to clip materials if you are tying flies with clamps and nippers. The Daiwa Figure 8 tool has become one of my "don't leave home without it" items. I don't carry a lot of gadgets: nippers and Spring Creek Clamps all the time, Flip Focals if I will be tying on tiny flies, but that's about it. This one, though, has definitely become one of my favorites. 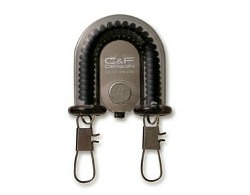 The C&F 2 in 1 Retractor holds two tools with secure clips. The safety pin attachment to your vest will not open easily. I decided to bring this back after a long absence because it is a more secure system. Losing a $30 tool because the attachment gave way is a bitter pill to swallow. That is not likely to happen with the C&F 2 in 1 Retractor. I use one to hold Angled Nippers and a Figure 8 tool. 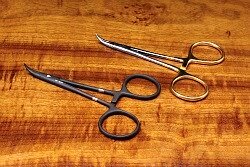 The silver circle between the two clips is a strong magnet that will your fly securely if you need to change tippets. All of the C&F products I have seen are excellent in both concept and form. C&F Design. The Gear Keeper is like a zinger on steroids. I use them more like a leash for my net and wading staff. It doesn't retrieve them but keeps them from floating away. The Shimano Net Leash is similar to a standard American net leash, but it has a very clever system for attaching the leash to your net. Most Japanese tenkara and keiryu nets do not have a screw eye in the end of the handle, as most American nets do. Thus, a simple clip or split ring won't work well. 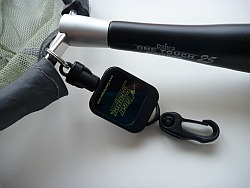 the Shimano Net Leash has a cord loop with which to form a girth hitch around the net hoop (and through the fine netting if necessary). The cord loop attaches to a secure clip on one end of the coiled leash. 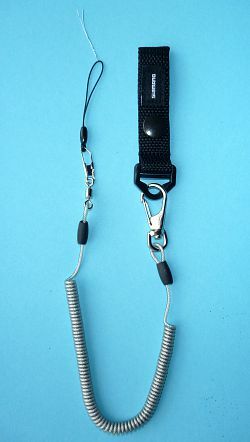 The other end of the coiled leash has a robust clip to attach to a D-ring on your vest. 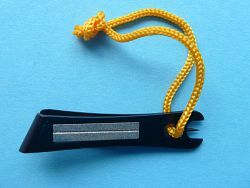 A belt loop is also provided for those anglers who do not wear vests. The Flip-Focal is an extremely popular aid for those anglers who have noticed that with each year that passes, the hook eyes seem to get smaller and smaller. Fight back with the Flip-Focal. These magnifiers clip onto the bill of your cap so they are always handy, and flip up out of the way when you don't need them. They are adjustable so you can position them just right, and they give you 2.5x magnification.